The Adjust Facial Features command is a light, automated version of the infamous Liquify feature, the power tool used to retouch many a magazine photo. Adjust Facial Features doesn’t allow for much manual manipulation, but the effect is pretty dramatic, not to mention seamless and easy to use. Get ready for retouching requests from friends and family! In the dialog box, a circle surrounds the area that will be affected by the adjustments. Note that Elements first analyzes whether it’s truly a face or not. We tried it with an image of a cat. No dice. 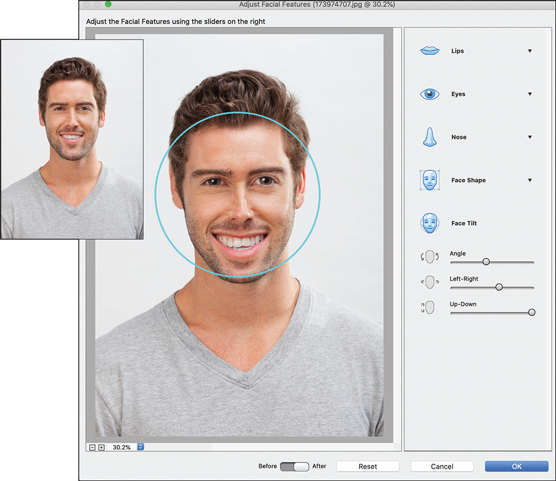 Use the sliders to modify facial features such as eyes, nose, lips, chin, and face, as shown here. The Adjust Facial Features command easily modifies facial characteristics.